Spinning off some of its assets in a master limited partnership (MLP). The company promised further details on these efforts at its Nov. 21 Analyst Day. These moves stem from the vocal demands of activist investor Carl Icahn, who owns a roughly 6 percent equity interest in Transocean. The billionaire didn’t become one of the world’s 30 richest people by making poor investment decisions. But individual investors who attempted to piggyback off Icahn’s activist efforts to unlock value at Transocean thus far have little to show for this game of follow the leader. 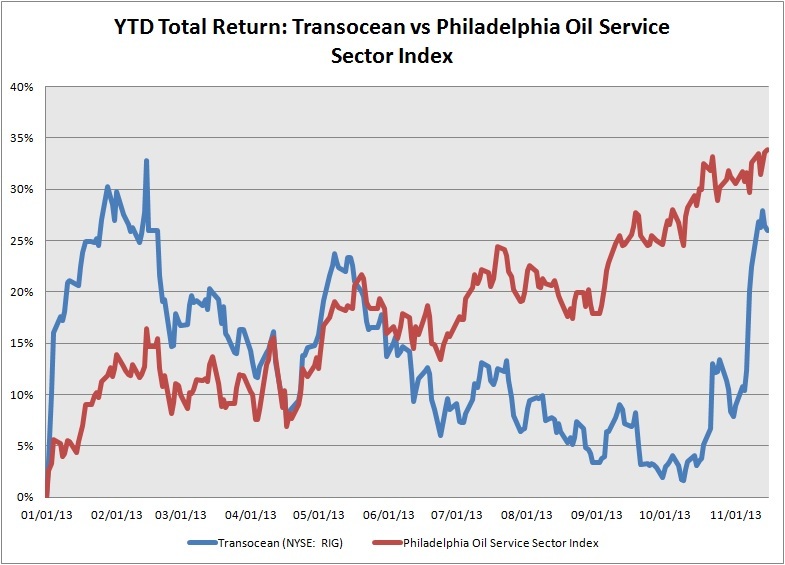 Since Icahn first reported a significant stake in Transocean on Jan. 4, 2013, the stock has generated a total return of 10.2 percent, underperforming the 25 percent gain posted by the Philadelphia Oil Service Sector Index. Icahn’s effort to unlock value from Transocean isn’t his first foray into the energy sector. On Feb. 16, 2012, Icahn launched a high-profile proxy campaign to take a majority stake in refining outfit CVR Energy (NYSE: CVI). Three months later, the billionaire investor had amassed an 82 percent stake in the company when most shareholders tendered their stock to him for $30.00 per share. In January 2013, Icahn-controlled CVR Energy spun off two Midcontinent refineries and related logistics assets as CVR Refining LP (NYSE: CVRR) in a $600 million initial public offering (IPO). Icahn’s campaign to acquire CVR Energy and the subsequent IPO of the company’s refining assets as an MLP has proved highly profitable for the shrewd financier. Since Icahn announced his plan to seek a majority stake in CVR Energy, the stock has generated a total return of 61 percent. However, this return looks less impressive when you consider that shares of fellow refiners Tesoro Corp (NYSE: TSO) soared 82 percent and Valero Energy Corp (NYSE: VLO) climbed 92 percent over this same period. And yield moths that flocked to CVR Refining’s have fared even worse. Since the publicly traded partnership’s IPO, the stock has generated a total return of less than 3 percent. In contrast, investors who opted to put money in our favorite refiner, Valero Energy, would be sitting on a 23.3 percent gain. The financial media’s incessant focus on celebrity investors has fueled a cottage industry of newsletters and investment strategies that seek to mimic the portfolio moves of corporate insiders and star investors such as Carl Icahn and Warren Buffett. But by the time harrowing stories of proxy fights and activist investments hit the mainstream media, the smart money has already been made. Instead of blindly riding these superstar investors’ coattails, you’re better off focusing on fundamentals–especially in the case of Transocean. Transocean leases offshore drilling rigs, associated equipment and crews to oil and gas producers for a daily fee. Exploration and production companies have ramped up spending on deepwater drilling activity dramatically in recent years, fueled by technological advances elevated oil prices, growing global oil demand and a need to offset waning production from maturing fields. These efforts have produced promising discoveries in the US Gulf of Mexico, as well as the massive pre-salt fields offshore Brazil and similar formations off Africa’s eastern and western coasts. Even Saudi Aramco has announced plans to drill Saudi Arabia’s first deepwater exploratory well in the Red Sea. Offshore production is expected to account for almost one-third of the forecast increase in global oil supply between now and 2020. As deepwater drilling activity has picked up, the day-rates that contract drillers charge for their highest-specification rigs have surged and currently sit near an all-time high. 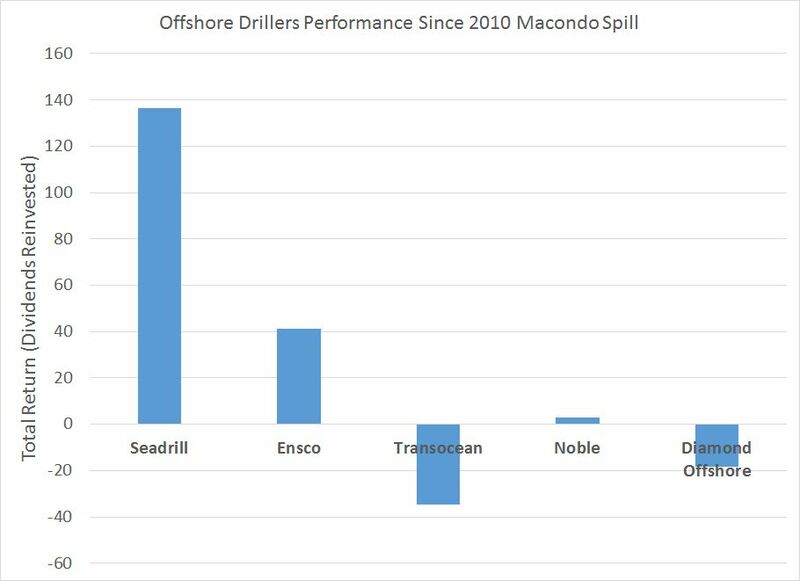 As the world’s largest offshore driller, Transocean might seem like a logical play on continued growth in deepwater drilling activity and strong day-rates. After all, the company’s portfolio of 75 floating rigs tops the industry. The firm has also amassed the largest fleet of rigs that can drill in water deeper than 7,500 feet. But the quality of a contract driller’s fleet is more important than the number of rigs. The average age of Transocean’s floating rigs clocks in at more than 20 years, while its average ultra-deepwater unit left was built almost a decade ago. The company also owns 22 mid-water floaters, a class of older rigs that can drill in water depths of 1,000 feet to 4,000 feet. In contrast, fellow contract drillers SeaDrill (NYSE: SDRL) and Ensco (NYSE: ESV) have smaller fleets that contain higher proportions of technically advanced rigs that can operate in the deepest waters. After the 2010 oil spill in the Gulf of Mexico, oil and gas producers have demonstrated a willingness to pay a premium for high-specification deepwater rigs. Transocean’s Deepwater Horizon, the older semisubmersible rig that was drilling BP’s (LSE: BP, NYSE: BP) ill-fated Macondo well, featured an outdated blowout preventer (BOP) that either failed to function properly or lacked sufficient power to handle the extreme reservoir pressure in this ultra-deepwater field. BOPs are critical fail-safe devices that seal, control and monitor oil and gas wells to prevent hydrocarbons from flowing uncontrollably. Newer rigs feature advanced BOPs and often have the deck space to accommodate two of these hulking pieces of equipment, eliminating expensive downtime in the event that one system requires maintenance. Not only do many older rigs still have outdated BOPs, but these vessels also lack the deck space to hold the modern versions of these hulking devices. A tight supply-demand balance in the market for ultra-deepwater rigs ensures that these advanced vessels earn elevated day-rates. Although shipyards will deliver a new wave of ultra-deepwater rigs over the next few years, these new arrivals aren’t expected to push the market into an oversupply. Regarding the worldwide order book for floating rigs, we count 32 competitive new rigs to be delivered before the end of 2014 of which about 13 rigs are uncontracted. Of the 13 rigs that are uncontracted, we believe about 10 rigs are in discussions with operators and could be committed. Based on our estimates and the number of active and expected tenders, we believe all of the newbuild floaters will be absorbed into the market as they are delivered. 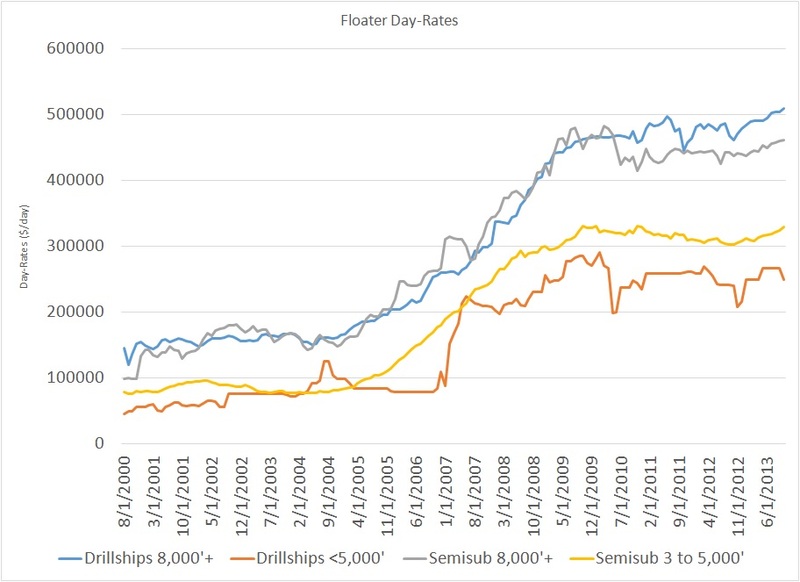 The scarcity of ultra-deepwater rigs should ensure that these vessels continue to earn above-average day-rates. SeaDrill’s management team has highlighted similar trends in its recent investor presentations. The company estimates that only 16 percent of the ultra-deepwater fleet operates in water depths of more than 7,500 feet. Instead, exploration and production outfits have deployed these advanced rigs in slightly shallower waters. In other words, these high-specification rigs continue to replace older, deepwater-capable units–yet another confirmation that operators prefer rigs with the newest safety equipment in the wake of the 2010 oil spill in the Gulf of Mexico. With one of the youngest fleets in the contract drilling industry, SeaDrill has benefited immensely from this trend. 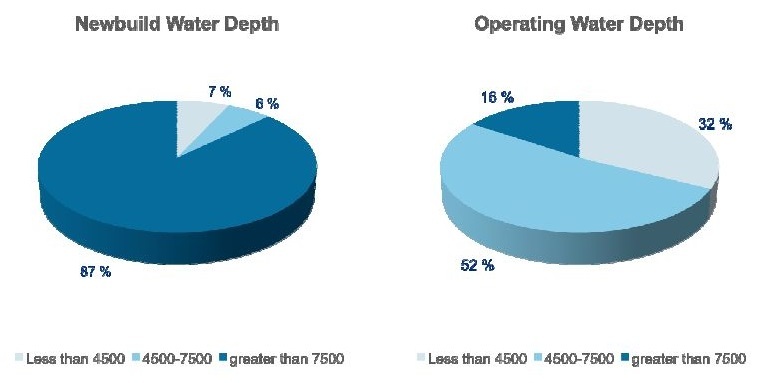 The average deepwater rig built before 2000 earns a day-rate of about $400,000, compared to the $525,000 per day that customers pay for SeaDrill’s average ultra-deepwater floater. This bifurcation extends to the market for jack-ups, rigs that operate in shallow-water plays; models built before 2000 earn an average of about $133,000 per day, compared an average day-rate of $160,000 for SeaDrill’s jack-ups. Recent fixtures suggest that the supply-demand balance for ultra-deepwater rigs remains tight. For example, SeaDrill secured a 180-day contract for the under-construction West Tellus that has a potential value of $150 million–equivalent to a day-rate in excess of $800,000. The company also inked a three-year fixture for its West Neptune drillship that could net the firm about $605,000 per day. As newly built ultra-deepwater rigs replace older units in shallower waters, some contract drillers face an uphill battle securing attractive fixtures for older deepwater and mid-water floating rigs. And new deliveries of ultra-deepwater rigs will only intensify these challenges. Analyst: …Just to follow up on Terry’s comments on the ultra-deepwater and the deepwater segment, if I could. Terry, did I hear you right that you expect some weakness for, you say, lower tier ultra-deepwater rigs to the $500,000 to $550,000 range. Is that predominantly for some of the smaller fifth gens [fifth-generation rigs] that you have? Terry Bonno: Yes, that’s what we’re seeing right now, is that sort of pattern. We know that as we look at some of the open opportunities and as we put our ear to the street, trying to figure out where we are, that’s the range that we end up in. Analyst: Okay, and then on the deepwater side, you noted recent fixtures, and there hasn’t been a lot of them, $425,000 to $475,000 and you are suggesting that it could be more weakness, probably below that range, and we may see some competitors maybe lower rates below that range. I just want to clarify that we could see more of a step down, whether it’s temporary or not, for some of the deepwater rigs? Terry Bonno: I think what we may see here, we may end up seeing a few of the deepwater rigs being bid into the midwater markets….I think we’re going to see that phenomenon just like we saw in the last cycle. In this excerpt, Bonno notes that day-rates for fifth-generation ultra-deepwater rigs–units built from the late 1990s to about 2005–have started to soften because of increasing competition from newly delivered vessels. Although fifth-generation rigs can drill in waters deeper than 7,500 feet, these units lack the power and capabilities of newer models. Bonno also acknowledged mid-water rigs face tighter competition for work because more deepwater-capable rigs have entered this market. Although Transocean’s management team views these challenges as temporary, these developments aren’t good news for the company’s older and less-capable drilling rigs. When news of the Macondo oil spill first broke in April 2010, I pounded the table for shares of SeaDrill, highlighting the company’s modern fleet and limited exposure to the Gulf of Mexico. In addition, SeaDrill’s policy of paying out the majority of its cash flow in the form of quarterly dividends made it the most shareholder-friendly firm in the space. At the height of investors’ negative sentiment toward offshore drillers, SeaDrill’s shares yielded more than 13 percent. The company also wins points for its forward-thinking management team. SeaDrill was the first contract driller to spin off some of its assets in an MLP, Seadrill Partners LP (NYSE: SDLP). Units of the publicly traded partnership have performed well since its initial public offering, returning over 42 percent since the close on its first day of trading. By selling assets to the MLP, SeaDrill enjoys a ready source of capital to fund further growth. SeaDrill’s stock has outperformed its peers handily since April 2010. The company also sports the highest valuation in the group, with an enterprise value to EBITDA (earnings before interest, taxation, depreciation and amortization) ratio of almost 13. The firm’s four largest competitors have an average multiple of less than 8. Although SeaDrill’s modern fleet and shareholder-friendly policies warrant a premium valuation, the stock looks overbought at current levels; investors sitting on big gains may want to consider taking some of their profits off the table. At the very least, investors should wait for the stock to pull back to about $40.00 per share before allocating more capital to this name. Our favorite contract driller recently hiked its quarterly dividend by 50 percent. Even better, the stock trades at a reasonable valuation and offers exposure to several near-term upside catalysts. Subscribe to Energy & Income Advisor to learn more about this opportunity.